Just because it's officially fall doesn't mean we're going to part with our favorite curbside lunch routine. Recently we visited St. Paul where we found a lunch well-suited to these cooler days. The red truck is adorned with two little cartoon characters sharing a noodle a la Lady and the Tramp. The woman inside called out to us loitering on the curb, struggling to decide on a noontime meal. "Do you like spicy food?" While those around us shrugged, squinting at the menu board, we jumped ahead. Why, yes, yes we do. "Try today's special, lemongrass chicken." That was the easiest decision we made all day. The menu board is stacked with several dishes from across East Asia, a collective of flavors from Vietnam, Korea, and Japan. Their menu items range from familiar wontons and gyoza to more ambitious pork katsu (Japanese-style curry), pork belly fried rice, and a Vietnamese-style pulled pork sandwich. We ordered some bulgogi tacos to accompany our chicken, and added a Vietnamese iced coffee to wash it down. The dark brewed coffee mixed with decadent condensed milk was just the right balance of bitterness and creamy sweetness. For $4, it's a great way to start a lunch with dessert. The lemongrass chicken came with generous chunks of tender thigh meat, sauteed with ribbons of caramelized onion and sprinkled with teensy lemongrass rings. The chicken was tossed in a kicky sauce and laid atop a bed of rice (we opted for the fried variety), all for $8. It's hard to know what to expect when something is touted as hot in Minnesota. Is it hot by beige palate standards? Or will it actually singe some eyebrows? With one bite of that succulent chicken, tears prickled at the corners of our eyes confirming that, yes, this was actually quite spicy. A forkful of the perfectly cooked fried rice tamed the burn before we dove back into the chicken. The sauce was incredibly flavorful with a lemongrass zing coming through with bright, herbal notes. The fried rice was mildly seasoned and devoid of the frozen bag peas, carrots, and other random vegetables that tend to pop up in lesser versions of this classic dish. This fried rice was treated very simply, with just some neat little squares of pork populating the plush grains. 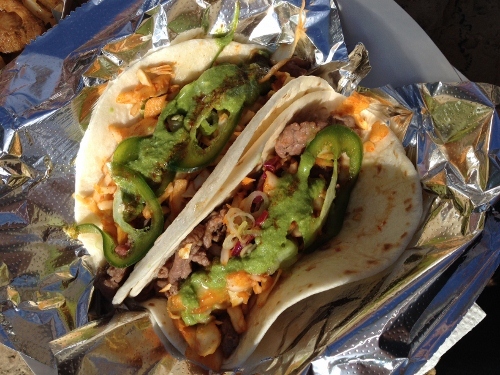 As for the bulgogi tacos, a pair will run you $7. They come served on soft, flour tortillas that have been treated to a quick toast on the flattop. Paper thin shreds of beef are seared so quickly that their center still retains a blush of pink, and the meat is topped with shredded kimchee cabbage and artfully garnished with thin slices of jalapeno. The Asian Invasion tacos reminded us of a time when food trucks were still a mostly West Coast fad, and when Roy Choi's Kogi truck first introduced the world to the idea of bulgogi, a slightly sweetly Korean-dressed, grilled meat tucked into a taco. The notion soon became a movement and before you could say, "extra kimchee, please," the dish and the food truck trend had swept across the nation. It became so popular that a vendor at our own Minnesota State Fair tried to replicate the spicy fan favorite, but came up short.The Asian Invasion tacos, on the other hand, have the bulgogi magic down pat. In fact, they are liable to spark a desire so fiery, you might just find yourself tracking the truck's every move on Twitter.